Gears Intermittently Difficult to Engage? Gears intermittently difficult to engage on a Peugeot 108? A customer of ours has a 2014 Peugeot 108 1.2L in the workshop that they are struggling to diagnose. The gears are intermittently difficult to engage. We have carried out some basic checks but cannot find the source of the fault. Is this a known fault? The symptom you describe is known to affect the Peugeot 108 with an EB2D (HMT) engine code up to 13/10/14 (RPO 13853). The fault is due to excessive friction between the clutch release lever and clutch cable ball joint. Fit a new clutch cable. Apply grease (MOLYKOTE BR2 PLUS) to the contact surfaces of the clutch release lever and clutch cable ball joint (Fig 1.1). 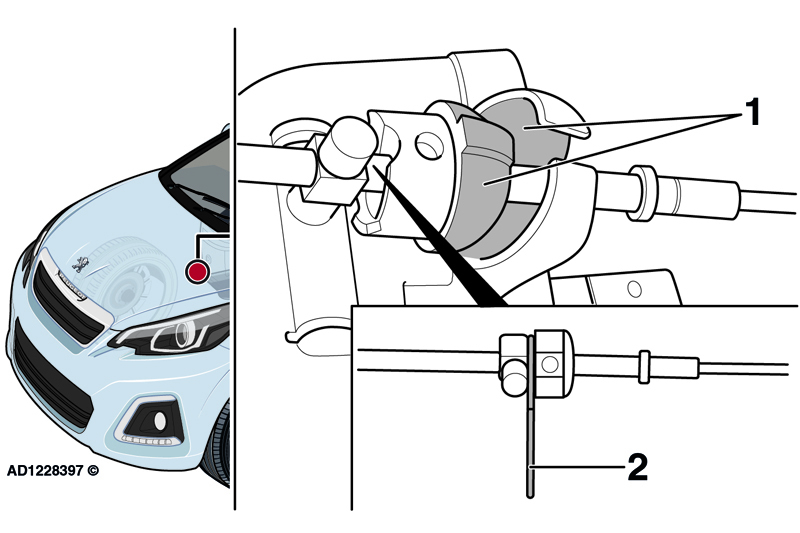 Insert a 2mm feeler gauge between the clutch cable nut and clutch cable ball joint (Fig 1.2). Tighten the clutch cable nut until it contacts the feeler gauge. Remove the feeler gauge. Fully depress and release the clutch pedal several times. Carry out a road test to confirm the fault has been rectified.